Gurukul Technicals Institute and Student can go for their own group/friend lecture to make science more fun. 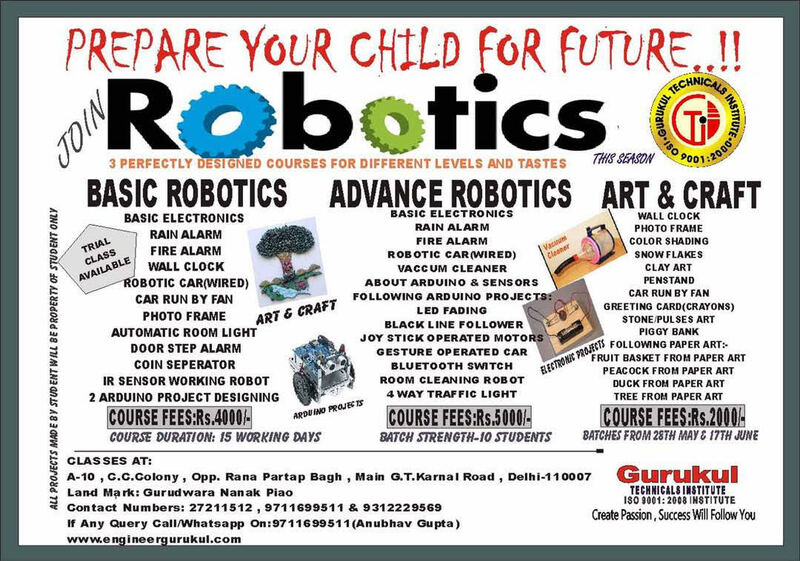 Gurukul Technicals Institute runs this robotics workshop in schools in regular basis in sponsorship of Gyanforprojects educational trust. Gurukul Technicals Institute also organises summer workshop for summer fun, weekday classes and weekend classes runs through out the year. As weekday classes and weekend classes are specially scheduled for evening so it will easy for student to align him/herself with school and tuition accordingly. 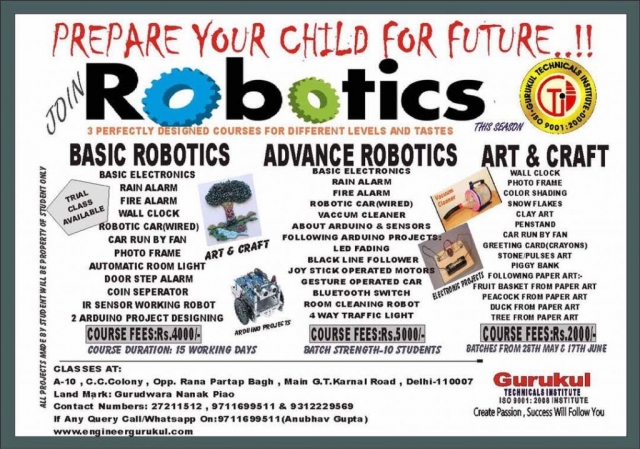 You can also go for Robotics classes at any time throughout the year at Gurukul Technicals Institute. Call/Whatsapp on 9711699511 for more information. Basic Electronics: Your kid will be getting basic information about Types of Condensers, Color Coding of Resistance, What are Transistors and How does a switch work, lots more about electronics your kid will be learning in this session. Condenser MIC Amplifier: As seen in School assemblies how does the MIC works? How does Speaker create sound by just a wired Black article? 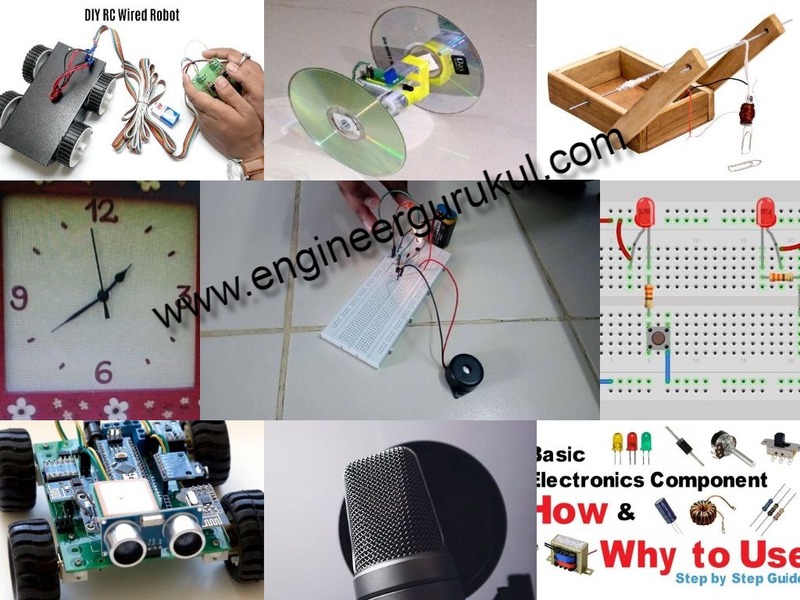 Your kid will be learn making circuit which will be converting your sound in electrical(speaker) form? Curious to know how it works? Your kid will tell you how did he/she made in this session of Robotics Class. Fire Alarm: Learn to make an alarm which will give sound as it receives heat on it’s sensor. Wall Clock: Everyday we see clock on wall to schedule our day. Man see to schedule meetings, Woman see to schedule household works and Children see to schedule their study time table. Its time to make your own Room Clock. Whether you want to paint it Pink or Blue, Car or Airplane, any type. Style is yours and Class is ours. Robotics Car: Car is an integral part of our life and we know how much kids love to play with it. To double the joy kid will be making his/her own car operating by a remote control. To make more interesting student can put cabinet of Truck to make it a truck or Student can put cabinet of Car to make it a car. Car Run by Fan: All about aerodynamics. How an airplane moves. your kid will be making a robotic car moving by propeller. Electromagnetic Crane: How an electromagnet crane works? Where to attach magnet and how to revolve it 360 degrees. Your kid will make a mini electromagnet and installing it on a crane by their own. Automatic Room Light: This is a very very interesting project. Your kid will be making an automatic room light in which in dark or evening the light will get automatically on. We can use this circuit in street light and as garage light as well to avoid wastage of electricity. Door Step Alarm: Guest are God! So we will welcome god smartly here. As soon as Guest will step on “Welcome Carpent” at house gate the bell will automatically ring. No need to raise hand to ring the bell now. 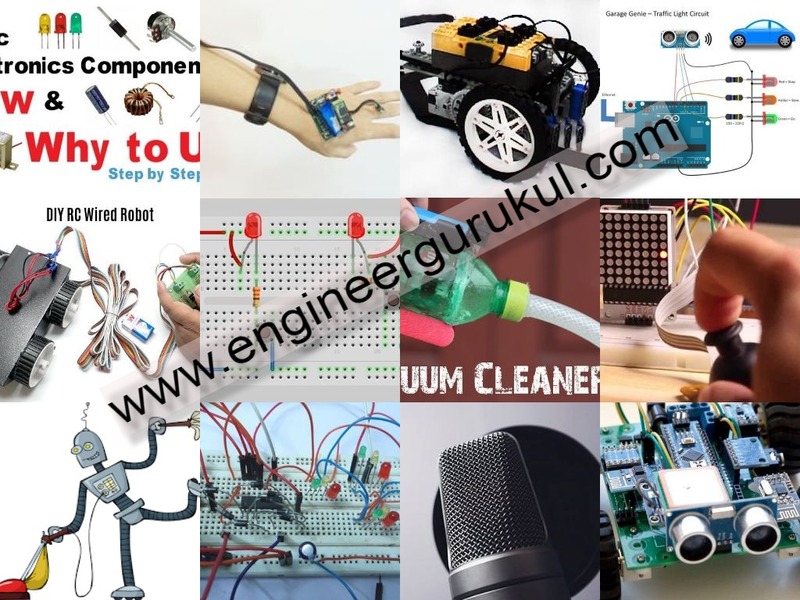 Enjoy making this circuit at Gurukul Technicals Institute, Delhi-110007. Dynamo Motor: In this your kid will be learning about how a motor produce electricity. Integration of Dynamo in daily life such as Generating electricity from Hydro Energy, Generating electricity from Wind Energy. Student will be making copper turns and placing magnet to make dynamo work. IR Sensor Working Robot: Make an interesting robot that will run by sensing your hand gesture. As you bring your hand in front of it it will move at rapid speed. The tyres will be big 2 CDs and it is really fun to build it. Your kid will learn real life work such as making a free wheel from a wood piece. Robotic Car: Car is an integral part of our life and we know how much kids love to play with it. To double the joy kid will be making his/her own car operating by a remote control. To make more interesting student can put cabinet of Truck to make it a truck or Student can put cabinet of Car to make it a car. Vaccum Cleaner: We all like cleanliness. In car, room, kitchen everywhere! In this class your kid will be making a vaccum cleaner of his/her own from a high RPM motor, a Tea Strainer(Channi) and few sticks of Glue Sticks. Get some interesting skills along making Vaccum Cleaner in this session. LED Fading: Arduino is a wonderfull platform to learn robotics. In this we will be controlling a LED from programming. We will be making different patterns like Dropping LEDS, Increasing and Decreasing pattern, Making a LED Fade from low to high and high to low. Black Line Follower: The topic which is B-Tech students study will now be studied by your kid. The making of smarter more smarter in this Advance Robotics Class. In this class your kid will be programming a code through which our robot will follow just a black line. Interesting isn’t it? Lets make it more interesting by making it practically. Hands On! Joy Stick Operated Motor Car: Your kid will be interfacing a Joystick with Motors and other operations ofJoystick with arduino we can make. Car Reverse Indicator or Bluetooth operated Switch: As seen in our modern car, as our car get reverse the red light gets increasing and as wall comes a buzzer starts to sound. The same mechanism we will be making here with couple of LEDs, Buzzer, Arduino, Coding and Lots of fun. Room Cleaning Robot: We will be making a such robot in this session which will move freely in a room and as it touches the wall, it will move back and start moving in a new direction. The room will get Clean by attaching a mop underneath. It is an interesting robot which will be making with sensors, mortors and coding in arduino. 4 Way Traffic Light: Delhi consists of lacks of Traffic light. We know it one of the best mechanism of traffic control all over the world. In this context we will learn how a traffic light system works. We will be making a circuit of 4 Traffic Light which will show how it works. Robotics for Below 10 Age also available. Kindly Contact on 9711699511 for any query or information. Classes Goes Through out the year. Weekend Batches also available. Group(more than 2) Discounts available.